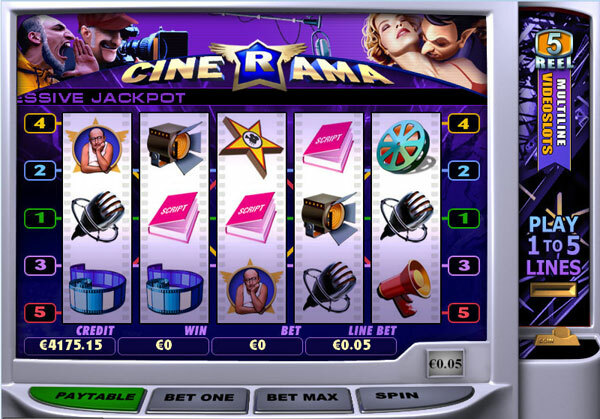 The object of Cinerama is to obtain a winning symbol combination by spinning the reels. The better your symbol combination, the bigger the payout. · Select the number of paylines you want to activate (in other words, to bet on) by clicking on the Bet One button or the payline number left or right of the reels. When you click on payline number 3 for example, you also activate paylines 1 and 2. Each click on the Bet One buttons activates one more payline. Click Bet Max or payline number 5 to select all paylines. Remember that your total bet (the amount you spend on the game round) is line bet (5c) x number of lines selected. Clicking Bet Max will also spin the reels automatically. · If the reels show a winning combination after they stop (along an activated payline), you win according to the winning table. Click the Paytable button to see the paytable, if you wish. Close the paytable by clicking the Paytable button again. If you win on multiple paylines simultaneously, your winnings are added up. The Bonus Round 1 symbol is an exception to that rule. Read more about Bonus Round symbols below. The tables show a certain number for every hit amount for every symbol. For example, if you have four Spotlight symbols in a row on an activated payline, starting on the leftmost reel, you have four hits. Read the number on the line “4x” next to that symbol. That is your winning amount. If you have winning combinations on multiple lines, add them all up to get the winning amount. The symbols have to lie consecutively, starting from the leftmost reel, to qualify as hits. The Director and Headphone symbols are bonus symbols. These symbols do not grant you any winnings, but they enable you to enter the Bonus Round. There is two bonus rounds in Cinerama. For Bonus Round 1, you need to get the Headphone symbol anywhere on the first reel. It does not matter if it is on an activated payline or not. For Bonus Round 2, you need to get three consecutive Director symbols on an activated payline, starting from the leftmost reel. When you enter a bonus round, follow the instructions on the screen. You will be paid a prize according to the choice(s) you make. A certain amount of each bet the players make when playing Cinerama, goes to the Progressive Jackpot pool. The player who gets five Camera symbols on an activated payline while playing for Max Bet, wins the Jackpot. The Jackpot is then reset and starts to grow again, as players make bets. You have to play for Max Bet (that is, with all five paylines activated) to win the Jackpot. Otherwise you will win a preset amount, independent on the size of the Jackpot. See the Paytable to see the winning amount (the numbers on the paytable are multiplied by your TOTAL bet to calculate the winning amount). The Camera symbol is also a wild symbol – meaning it stands for any other symbol, except the Director and Headphone symbols, and forms winning combinations in a way most profitable for the player. Only two.